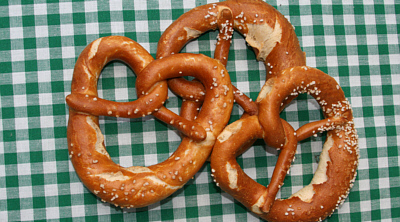 In our Alpine Lifestyle Chalet-style recipes section we have on most popular recipe, which is: Kasnockn. First of all this dish is known in many Alpine regions, sometimes with different names like Kaesspaetzle, Kaesenockerl, Kaesknoepfle or Kasspatzn, and second the dish is delicious, third recipes with melted cheese and cheese crust are highly popular. That is why we provide a new recipe which hast both melted cheese and cheesy crust. Maybe you have seen the legendary Austrian dish Kaspressknoedel on a menu of a a ski hut or Alpine chalet, or even tasted it. They are typically eaten with salad or in a soup. They are easy to cook and will be the perfect dish for an Apres-Ski-holiday invitation for friends or an Instagram or flickr presentation of your vacation in the Alps. 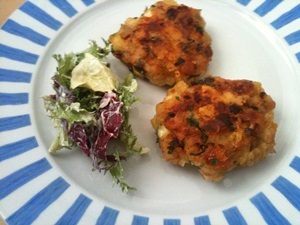 The name of the dish Kaspressknödel means translated squeezed cheese dumpling, as this Knoedel variation is not round. 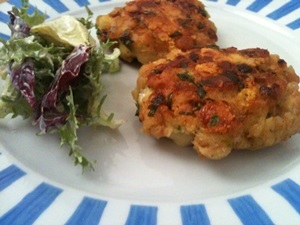 The are fried or roasted Semmelknoedel (bread dumplings) with cheese. The ingredients for the dumplings are like the basic recipe for Semmelknoedel / bread dumplings, we changed this recipe a little – and the nice things about these dumplings, as they are fried, they are easier to make and will always turn out well. Finley chop the onions and sauté them in a little bit of oil. HINT: to get beautifully fried onions, the fresh onions need to loose liquids, they will loose them quicker if you add some salt when you start to fry them. 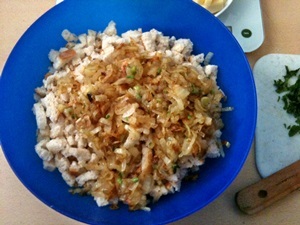 Put bread cubes into a big bowl, let fried onions cool and add them to the bowl. Add egs and lukewarm milk and mix, add flour. 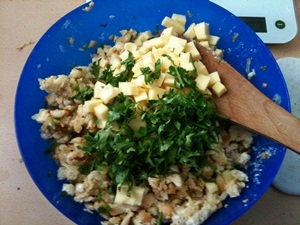 Cut cheese into cubes, chop parsley, mix into the knoedel mixture and season with salt and pepper. Take out the amount of the mixture about the size of your fist, press well together and shaped them into a wheel (make a round dumpling and press flat to about the hight of 1.5 to two 2cm). Slowly fry both sides in hot oil. If you buy them ready made in a deli or eat them in restaurant, inn they are usually the size of a palm. They are easier to fry when smaller and you can more often ask for seconds. You can serve your Kaspressknoedel in broth or eat them with green salad or mixed salad, with a nice dose of vinegar (on the salad, not the knoedel). Kaspressknoedel are a typical dish from Salzburg, Austria. 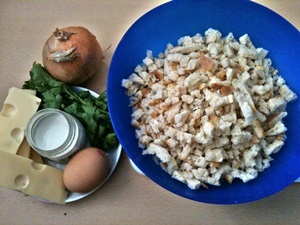 Like most traditional and rural dishes Kaspressknoedel is a vegetarian meal.